Over the last few years, wallpaper has come back in fashion and there are loads of fantastic designs out there. Wallpaper is not just for walls, you can decorate loads of things with it. As many great design houses produce their own wallpapers it can be a cheap way of getting that designer look. 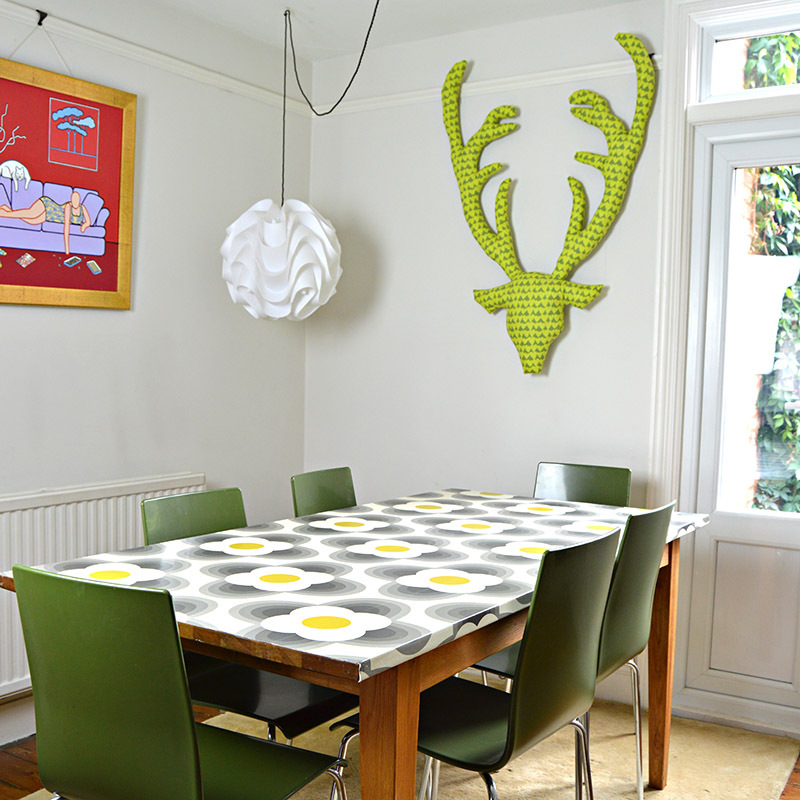 My friend Wendy loves Orla Kiely prints and has found an affordable way to get Orla Kiely into her home by using wallpaper. I’ll show you how wallpaper can be used to transform furniture and fixings in your home. The great thing about upcycling with wallpaper is that not only does it come in thousands of cool designs it is quite robust and flexible making it easier to stick to objects than ordinary paper. Choose your wallpaper carefully. Make sure you have a design pattern that will fit. Bear in mind that a roll of wallpaper will most likely not be wide enough to go round the bin in one go and you will be using 2 or 3 pieces, so think about pattern join. 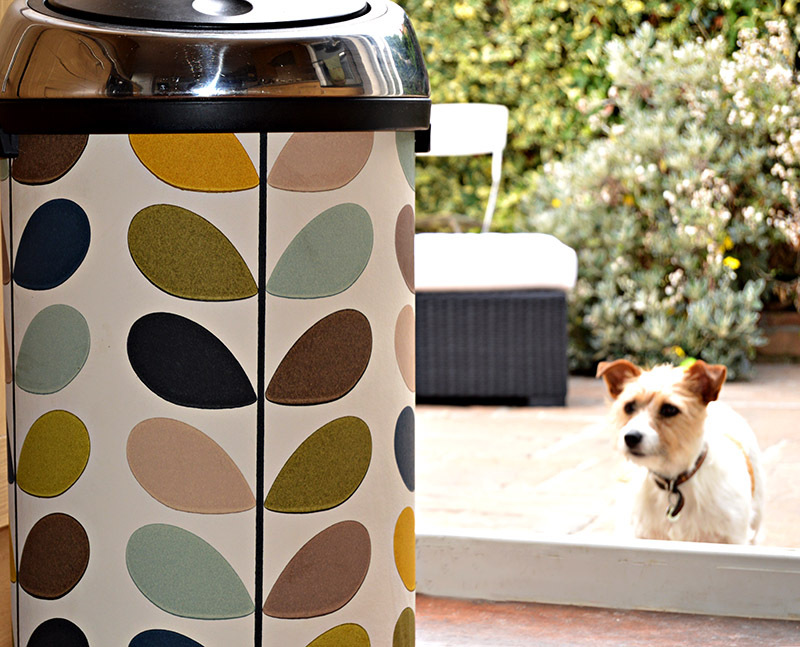 We used an Orla Kiely Stem pattern for our bin. If you can, remove the handles of your bin, if not don’t worry you can work around these. For the wallpaper paste to stick to your bin you will need to key it. 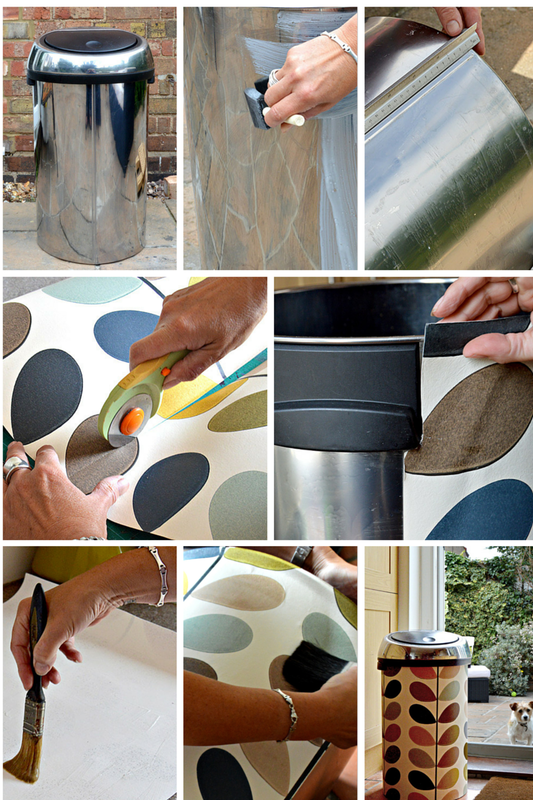 To do this mix a solution of 25% PVA (Elmers) glue to 75% water, cover the bin and leave to dry. Measure the height of your bin carefully, and maybe add a couple of mm to be sure, as you can always trim the wallpaper later. Also, measure the circumference of the bin, this will be the width of wallpaper needed. For this bin, the circumference was 2 and bit widths of the wallpaper roll. Cut each width of wallpaper you will need to the bin height. Make sure you cut it where the repeat pattern will match, this may involve cutting the piece further down the roll. One of your pieces is also likely to be only part of a rolls width. Cover your first width liberally with wallpaper paste, and place on the bin. You should be able to move it around quite easily to make sure it is straight ( a spirit level may help with this). When placing your first piece of wallpaper you may want to consider that there will be a join and ensure that this is at the back of the bin where it will be less visible. Cover the next piece in paste and line up next to the first piece on the bin. If you have not been able to take your handles off you may have to cut around them using wallpaper scissors. Also make sure that the wallpaper is flush with the top and bottom of the bin, if not trim accordingly. Brush as before and repeat with the third piece if needed. Most wallpaper is wipe clean so you can leave the covered bin as it is, but if you want to make sure of better protection from spills I suggest you apply a final coat of waterproof varnish or PVA. When finished re-attach any handles that were removed. 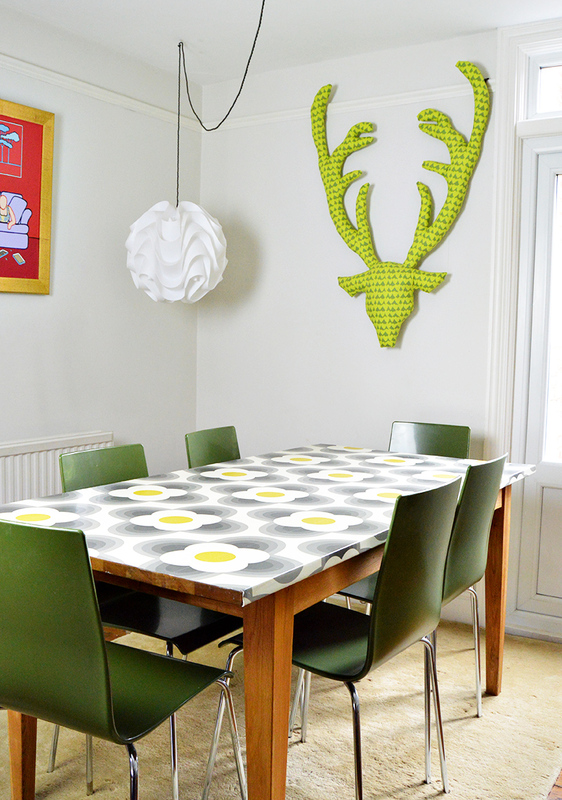 You can transform any old table with wallpaper from small side tables to large dining room tables. 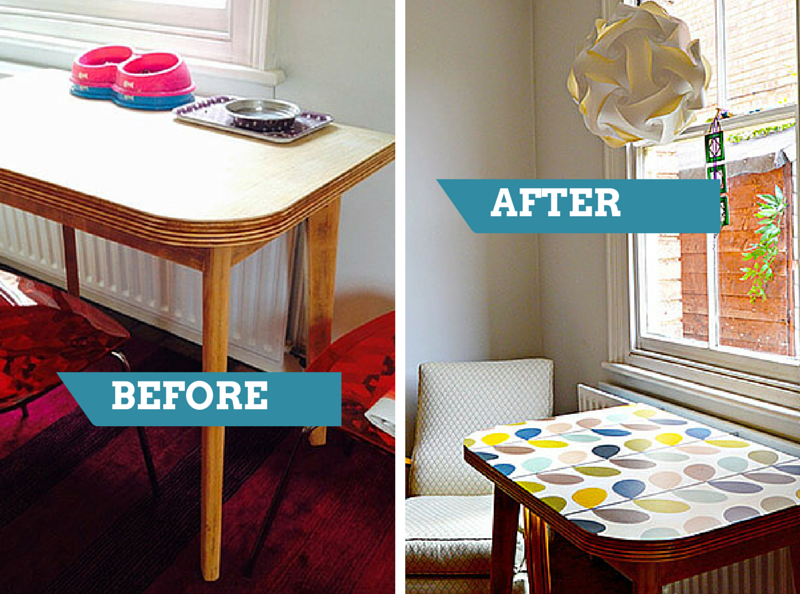 It is really easy to do and can bring a new lease of life into an old table and turn something ordinary into something cool and interesting. Layout your wallpaper first to make sure that your chosen design will work. In most cases, the wallpaper will not be wide enough to cover the table so you will need to make sure that you can match the repeat pattern when laying in strips. 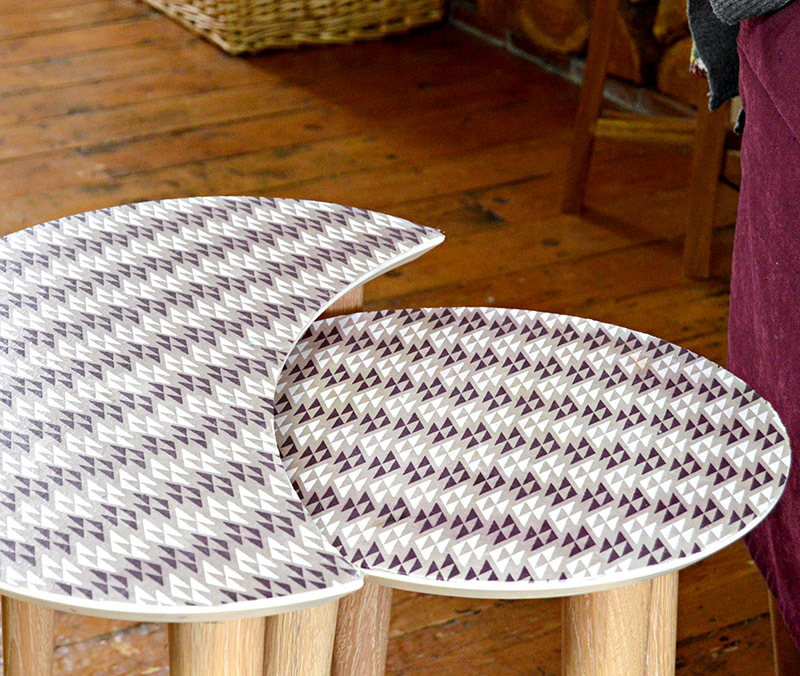 Geometric patterns work well with tables and smaller patterns are easier to match. You can use wallpaper paste to stick your paper to the table. However before you start make sure the table top is clean and sand lightly to establish a key. You will need to protect your table afterwards, I recommend in coating it with at least 2 coats of waterproof varnish. 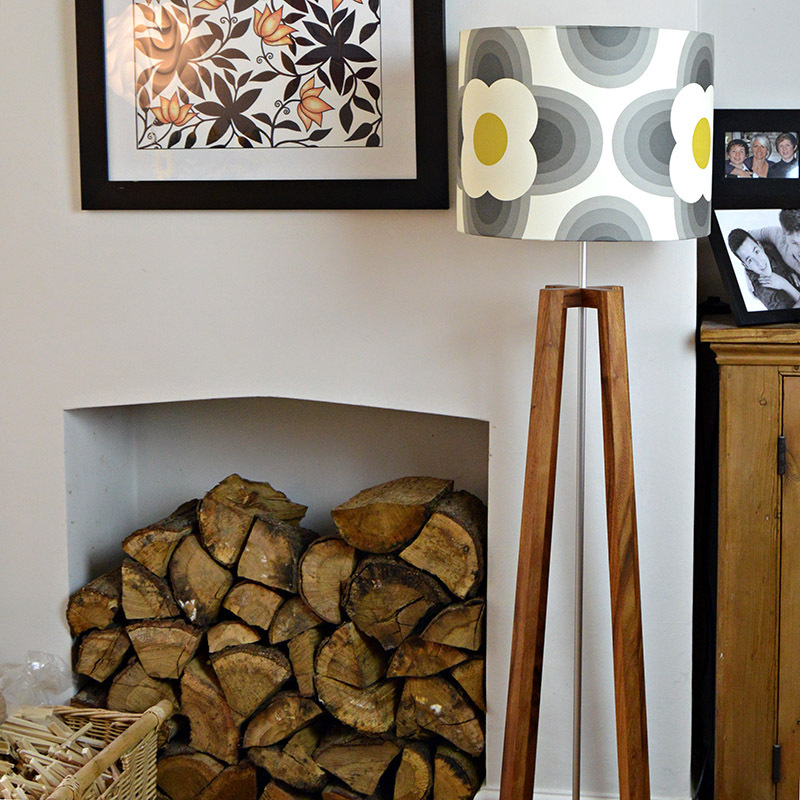 Want a Marimekko or Orla Kiely lampshade ? they are so easy to make yourself ! You might want to check out my tutorial on how to wallpaper lampshades to match your decor. There are loads of affordable lampshade kits in various sizes on the internet, and instead of using fabric you can use wallpaper to make your lampshade. These kits are really easy to use, and not only do you get to choose your own lampshade design you get to choose the size you want, not limiting you to whats available in your home decoration store. As with using wallpaper to cover a table, you will also need to make sure that the design of your wallpaper pattern is suitable for transformation into a lampshade. 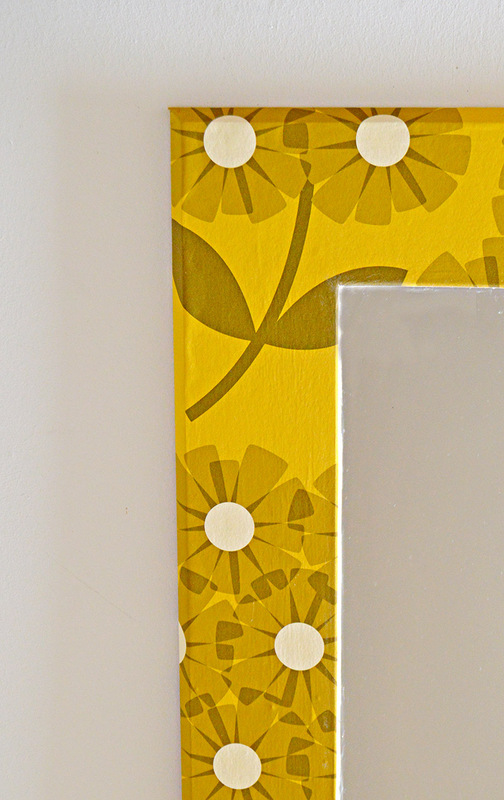 Scraps of wallpaper can be used to transform the frames of mirrors and pictures. If you use wallpaper for any home decoration crafts I would love to hear about them also if you have a particular design favourite. 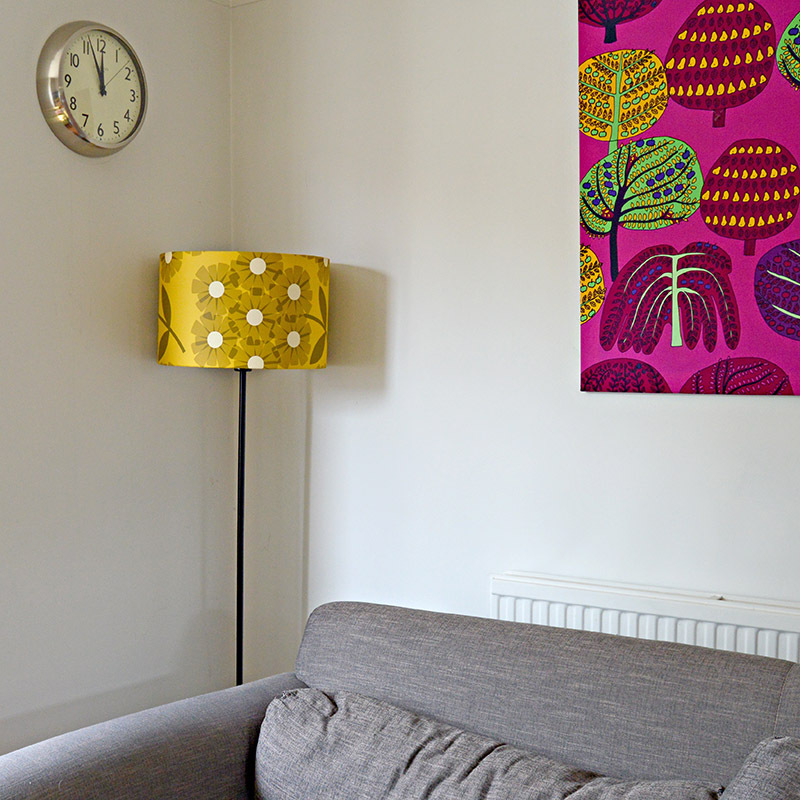 As well as Orla Kiely and Marimekko, I love Designers Guild and Graham & Brown have some great contemporary wallpapers. Some designer wallpapers can be expensive but often I pick up odd rolls and part rolls cheaply on ebay. Hello! Fabulous ideas, thank you for sharing! Question: Would this work on fabric lampshades? Thank you. You can make a Lampshade with wallpaper or fabric by just using the wire frame. Thank you Michelle, yes very easy. I love all your upcycle ideas but you, please, need to learn some rotary cutter safety uses. They are very dangerous instruments. Thanks your welcome, I do love her simple retro designs. I have been looking for a new design for an old table I bought to refurbish for my dining room. Thanks for the great tips and idea to use wallpaper! I had some special paper I did not want to throw out, but didn’t know what to do with it. So you have helped me solve two of my problems. Thank you ! I’m pleased that I have been able to help. Where did you get the white ball-shaped hanging lights? Thank you ! I can’t quite remember where I got the lights but they are Scandinavian in design so I would check out any Scandinavian furniture shops. Thank you ! That’s really nice to hear. I’m thinking of using wallpaper when I revamp my stairs. I use what is called PVA glue in the UK and buy it from the builders yard, but with wallpaper that is only for the key. I then use wallpaper paste to stick the paper followed by a varnish. I’m sure modge podge works just as well. I use PVA because I can buy it in 5 Liter tubs very cheaply where as modge podge is rather more expensive. Thanks for your answer!! I just found it odd that wallpaper would stick to Elmer’s glue!! I’ll have to give this a try!! Your lesson gave me an idea. I think I will use this idea to make a laundry hamper out of PVC pipe and w/wooden lid. I hope to try this in the near future. I love what you did. Thanks. Love this project – Use to really like wall paper, it has that vintage feel. These projects are really neat and wow do I ever love this font on your site. Have a great weekend! Thank you ! yes the wallpaper has a 50’s vibe about it. Congratulations, Claire! This post will be featured this week at My Flagstaff Home! Does this work on plastic garbage cans as well? I don’t see why not I’ve covered a Formica table before, just make sure you key it first with diluted PVA glue. Wondering if wallpaper / varnish could safely be used on countertop where I knead bread dough ? Love your ideas!! I’m not 100% sure about this, but have had a look round and apparently you can get a bar top varnish that would protect it well, and I can’t find anything that says yacht (marine) varnish isn’t safe once dried. I personally would cover the counter top in wallpaper, then apply at least 2 coats of yacht varnish. You could always use a glass chopping board on top of the counter if you are really concerned. You might want ask person at hardware store if there is one that is food safe. From what I hear and told if you are going to use it for food the regular version is not safe. 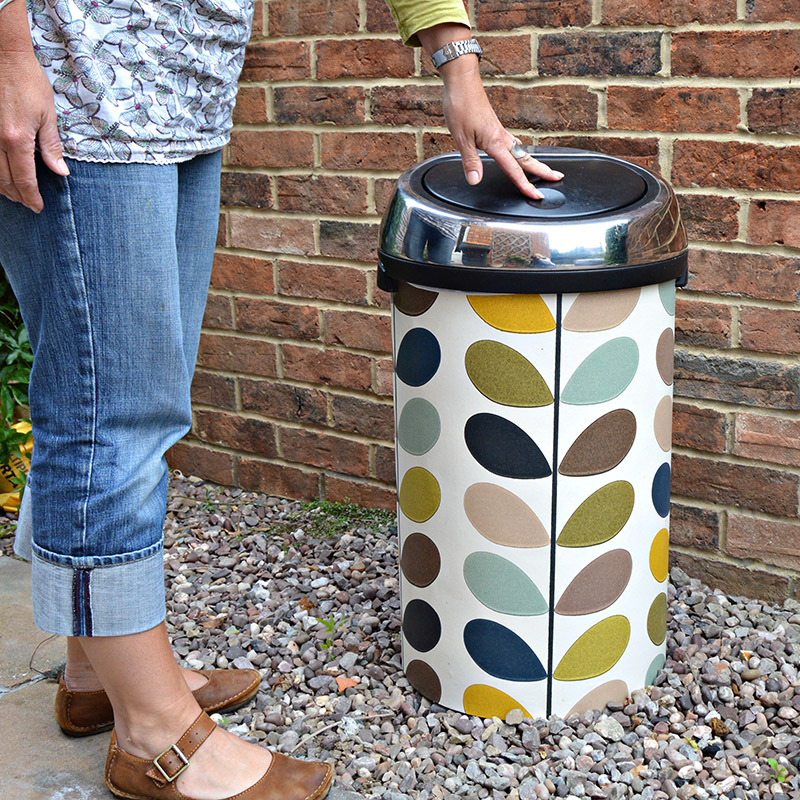 What lovely ideas, I am a huge fan of that Orla Kiely design it looks lovely on the bin, I would worry about tea bag splashes making marks (we get a lot of those down the front of our kitchen bin) but as you say I guess a coat of varnish could fix that – or I could cover a waste paper bin instead. I like the picture frame idea too, so versatile with all the lovely papers out there – thanks so much. Thanks, the bin is still looking great the varnish is managing to deal with the dripping tea bags. 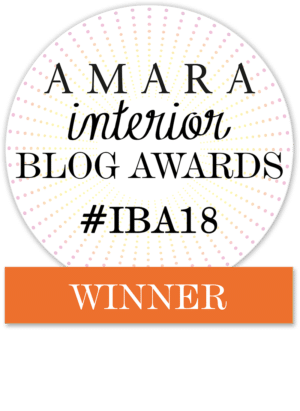 Fabulous inspiration in this post. I love the retro wallpaper you used on all of these pieces. Gotta love decoupaging to give things a totally new look. Love it! 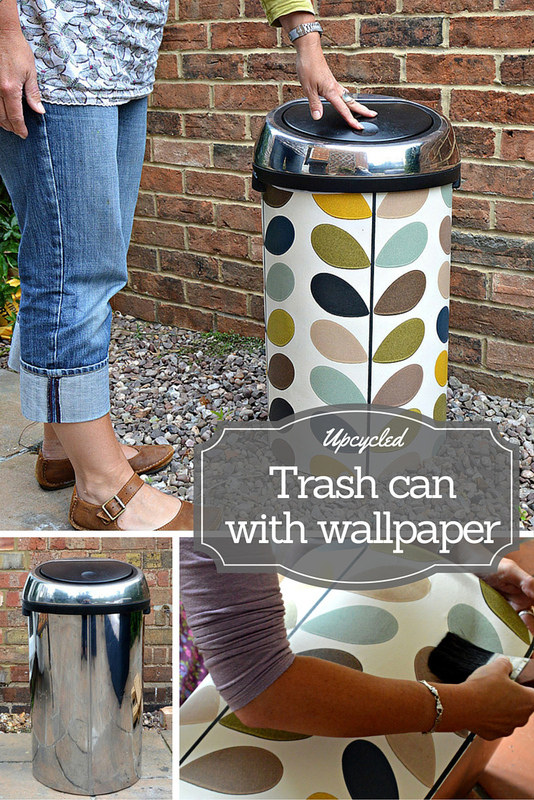 Love the covered trash can! I’ve been wanting a metal one for awhile, but have been holding back because they just aren’t pretty. I will totally have to do this! Brilliant ideas that all look fantastic! Thanks, it’s amazing how you can change a bit of old furniture with some bright patterned wallpaper and there are so many fantastic designs out there to choose from. wonderful ideas, love it! thanks so much for sharing on craft schooling sunday and becoming a regular, great to have you and your talent! Thank you and thank you for hosting a great link up.